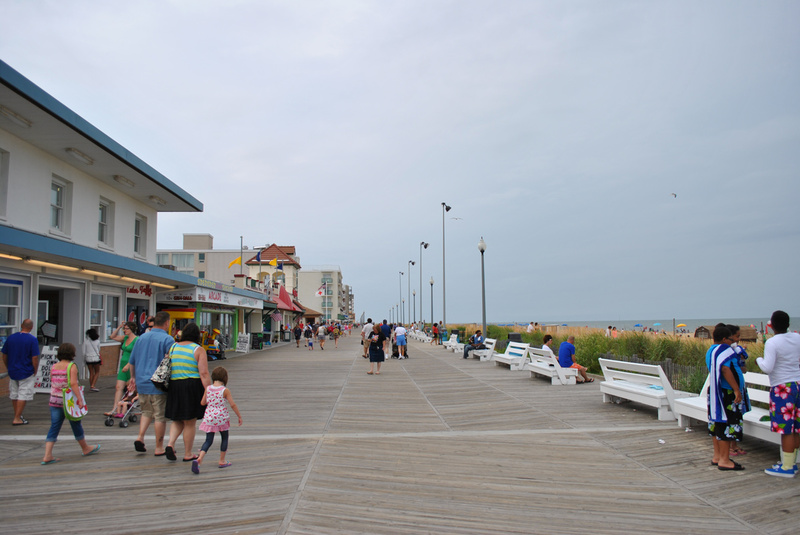 With origins in 1873, the Boardwalk in Rehoboth Beach extends for one mile along the Atlantic Oceanfront. 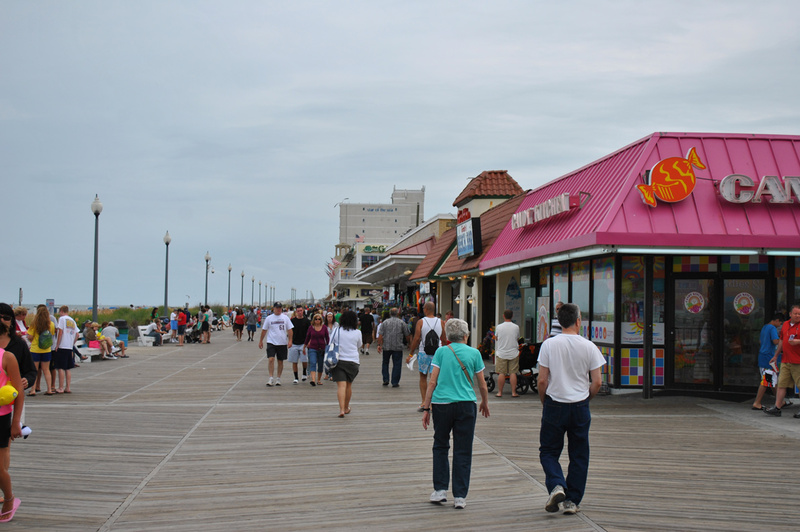 The city business district stretches west from the Boardwalk along Rehoboth Avenue (SR 1A west of Bayard Avenue). Photo taken 06/18/12. SR 1A comprises a short loop east from SR 1 (Coastal Highway) through Rehoboth Beach in Sussex County. The east-west leg along Rehoboth Avenue provides the main access route to the Rehoboth Beach oceanfront and the nearby community of Henlopen Acres from SR 1 to the west. The north-south leg follows Bayard Avenue from Downtown Rehoboth Beach to Silver Lake. The route passes through the unincorporated Silver Lake Shores community before returning to SR 1 in the town of Dewey Beach. The angle of the intersection between Delaware 1A and Delaware 1 (Coastal Highway) defaults motorists from Rehoboth Avenue westbound onto Coastal Highway northbound. Rehoboth Avenue Extension spurs northwest from there along side Delaware 1 to Sea Blossom Boulevard, where drivers headed for Coastal Highway south can turn toward Dewey Beach. The service road is also considered apart of Delaware 1A. 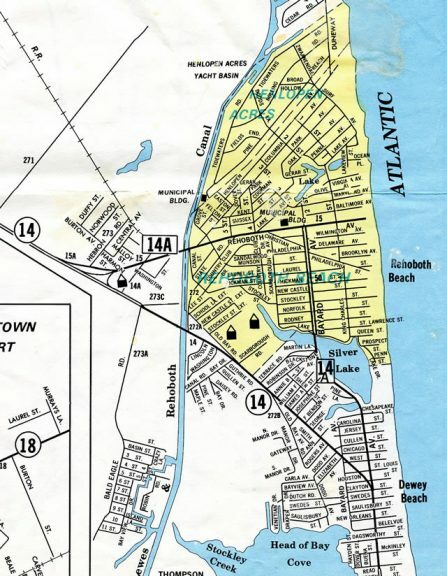 Prior to the 1974 redesignation of Delaware 14 north from the Maryland state line to Milford as Delaware 1, Delaware 1A was numbered as Delaware 14A. The route followed the same alignment as Delaware 1A does today. Delaware 14 and 14A through the Dewey and Rehoboth Beach areas. Rehoboth Boulevard constitutes a four-lane divided boulevard with on-street parking from the Boardwalk west to Delaware 1B (State Road). Motorists leaving Rehoboth Beach and headed to Delaware 1 south are advised to use State Road at the forthcoming intersection. Photo taken 01/16/17. A lane drop occurs west of the Lewes and Rehoboth Canal bridge along Delaware 1A (Rehoboth Boulevard) north, so motorists headed to Delaware 1 (Coastal Highway) north to Midway and Five Points are directed to move right ahead of Delaware 1B. Photo taken 01/16/17. Delaware 1B is unmarked as it begins from Rehoboth Boulevard south along State Road. The short connector leads to ramps with both Delaware 1 north and south by its bridge across the Lewes and Rehoboth Canal. Photo taken 01/16/17. SR 1A (Rehoboth Boulevard) proceeds west from SR 1B to a roundabout with Grove Street south and Columbia Avenue north. Photo taken 01/16/17. Grove Street angles southeast to the Country Club Estates neighborhood beyond SR 1B (State Road) while Columbia Avenue connects with the Henlopen Acres community. Photo taken 01/16/17. SR 1A (Rehoboth Boulevard) crosses the Lewes and Rehoboth Canal and leaves the city of Rehoboth Beach. Photo taken 01/16/17. A single leaf bascule bridge spans the Lewes and Rehoboth Canal. The waterway links Rehoboth Bay by Thompson Island to the south with Delaware Bay at Roosevelt Inlet to the north. Photo taken 01/16/17. Continuing west, Delaware 1A narrows to two lanes beyond the upcoming intersection with Church Street. Photo taken 01/16/17. Reassurance marker for SR 1A north posted between the Edgewater Park and Washington Heights town home communities. Photo taken 01/16/17. Church Street angles southwest across SR 1A (Rehoboth Avenue) to SR 1 (Coastal Highway) northbound. Photo taken 01/16/17. An end shield precedes the Delaware 1A northbound split with Rehoboth Avenue Extension and Delaware 1 (Coastal Highway). Photo taken 01/16/17. Rehoboth Avenue Extension provides access to Hebron Road north in addition to completing the movement for Delaware 1 south. Photos taken 01/16/17. The SR 1A northbound mainline defaults onto SR 1 (Coastal Highway) north to Midway, Five Points and Milford. Photo taken 01/16/17. Rehoboth Avenue Extension carries two-way traffic from Hebron Road west to Sea Blossom Boulevard as a frontage road to Delaware 1. Photo taken 01/16/17. Rehoboth Avenue Extension ends at Sea Blossom Boulevard between adjacent Delaware 1 and the Rehoboth Crossing community. Photo taken 01/16/17. The unsigned branch of SR 1A concludes at SR 1 (Coastal Highway) opposite Shuttle Road. Photo taken 01/16/17. The first confirming marker for Delaware 1A south stands just east of Delaware 1. Photo taken 06/18/12. A second shield for SR 1A appears along the commercial strip of Rehoboth Avenue between Coastal Highway and Church Street. Photo taken 06/18/12. Church Street angles northeast across SR 1A (Rehoboth Avenue) from SR 1 to Canal Crossing Road and the Edgewater Park gated community. Photo taken 06/18/12. Still within unincorporated Sussex County, Delaware 1A remains well signed to the Rehoboth Beach city line. Photo taken 06/18/12. Delaware 1A (Rehoboth Avenue) passes between several townhome communities east of Church Street. Another reassurance marker appears at Atlantic Avenue. Photo taken 06/18/12. Motorists along Delaware 1A south cross Lewes & Rehoboth Canal into Rehoboth Beach. The three-lane wide bascule bridge was built in 1986. Photo taken 06/18/12. Rehoboth Avenue expands into a four-lane, landscaped boulevard just east of the canal. A roundabout funnels traffic to Grove Street south and Columbia Avenue north into adjacent residential areas. Photo taken 06/18/12. Delaware 1B ties into Delaware 1A (Rehoboth Avenue) at an unmarked intersection with State Road south and 5th Street east just prior to this scene. 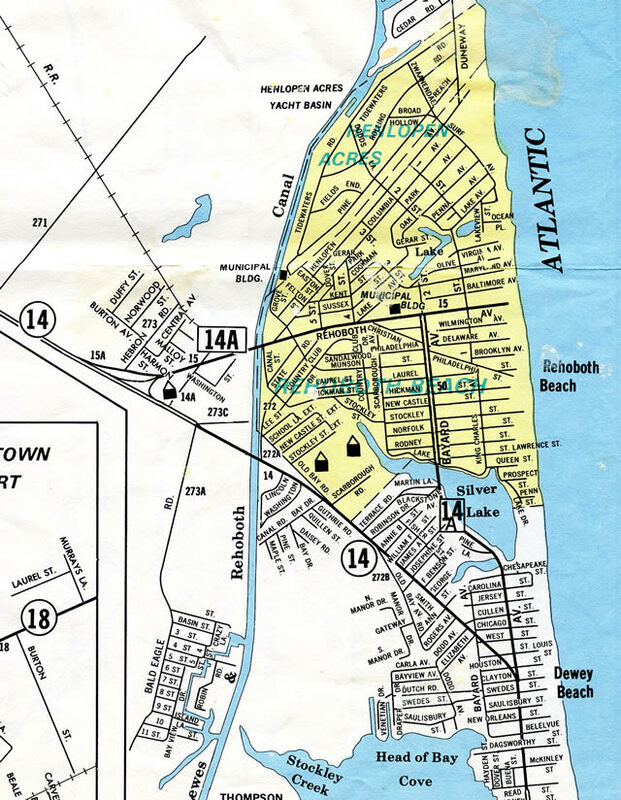 SR 1B provides a direct route into Rehoboth Beach from the south. Photo taken 06/18/12. The turn of Delaware 1A from Rehoboth Avenue east to Bayard Avenue south is unsigned. Rehoboth Avenue continues another third of a mile to the Boardwalk otherwise. Photo taken 06/18/12. Bayard Avenue bisects the residential street grid of Rehoboth Beach south to Silver Lake. The first south SR 1A shield in Rehoboth Beach is this trailblazer at Rodney Street. Photo taken 06/18/12. Delaware 1A south leaves the Rehoboth Beach city limits at Silver Lake. The bridge across Silver Lake uses wooden spans to support the road deck. The crossing dates back to 1938, and was rehabilitated in 1995. Photo taken 06/18/12. Robinsons Drive angles southwest from Silver Lake Drive to Coastal Highway by this trailblazer directing motorists southward along Delaware 1A to reach the state route at Dewey Beach. Photo taken 06/18/12. Silver Lake Drive wraps around the west side of Silver Lake to a point just north of Dewey Beach. Delaware 1A transitions to King Charles Avenue through the town. Photo taken 06/18/12. King Charles Avenue leads Delaware 1A south from Silver Lake Shores to Delaware 1 (Coastal Highway) in Dewey Beach. The route ends at a wye intersection where Delaware 1 turns south toward Delaware Seashore State Park. Photo taken 06/18/12. Rehoboth Avenue intersects 1st Avenue midway between the turn of Delaware 1A (Bayard Avenue) and the Boardwalk in Rehoboth Beach. Left turns are prohibited here, with motorists directed ahead to U-turn for 1st Avenue north to Henlopen Acres. Photo taken 06/18/12. On-street parking lines both sides of Rehoboth Avenue on the portion east of Delaware 1A. This scene looks west ahead of 2nd Street. Photo taken 06/18/12. J-turns provide north and southbound access from Rehoboth Avenue to 2nd Street and Bayard Avenue (Delaware 1A) respectively. Photo taken 06/18/12.